The current exhibit of the 2010 Nebraska Arts Council fellowship winners isn’t just another art exhibit, says curator Hesse McGraw. As the show’s title explains, “it’s Another Nebraska .” Every three years the NAC honors visual artists living and working in Nebraska. This year nine were awarded a total of $23,000. Winners of the $5,000 Distinguished Artist Award were Jamie Burmeister (sculpture/installation) and Liz Vercruysse (sculpture/installation). A $2,000 Merit Award was given to Anthony Hawley (sculpture/installation), Michael Morgan (sculpture/installation, Francisco Souto (printmaking), Therman Statom (sculpture/installation), Peter Walkley (painting/drawing) and Mary Zicafoose (craft/textile). In addition, Mary Day (sculpture/installation) won a $1,000 Merit Award. The NAC recognizes the artists not only for their past creative work but because of “their important contributions to the quality of life in this state.” It’s the latter that motivated the Bemis Center for Contemporary Arts to begin exhibiting the winners in 2004, and it helps explain this year’s title choice by McGraw, the venue’s curator. “There is another Nebraska,” he said, “and this exhibit is a further recognition of public support for its artists at a time when the 1% for Art program is under threat. It proves there is a need for additional narratives in this state.” To organize this exhibit, which continues at the Bemis Center through April 9 and at the Fred Simon Gallery through Mar. 4, all artists were asked to contribute current work according to what qualified them. Interestingly, aside from the paintings of Walkley, the tapestry of Zicafoose and the drawings by Souto, the 2010 judges showed a strong preference for installation, mixed media and non-traditional sculpture. All of which gives this show a very contemporary vibe lending itself well to the urban/industrial environs of both Bemis and the Fred Simon. Overall, the exhibit is quiet, sophisticated and unassuming. The tone then is inviting with the bright, vivid wall hangings of Zicafoose on the far wall and pleasant, environmental music enticing both eye and ear into what can only be described as a Zen-like experience. This is another Nebraska, and it features work that is largely spare, minimal and mostly monochromatic in neutrals of whites, blacks, beiges and grays. The understated lighting and careful arrangement of open and filled spaces and sightlines lend some pieces a particular dignity, others an element of surprise. For example, Day’s corner installation of blonde poplar and reed sculpture and complementary charcoal drawings sits serenely to the right of the gallery entrance. The willowy, organic sculptural pieces are characteristic of her cosmic, visionary style as they spin in orbital fashion over and around their multi-level pedestals. Yet, the heavier charcoal drawings that support the sculpture design seem an unnecessary interruption in her otherwise lyrical Conversation . A more pleasant distraction is the sudden appearance of bare light bulbs flashing on and off above the window wells on the east wall. These “bright ideas” pulsate in Morse code to Burmeister’s site-specific light installation outside at both Bemis and the Fred Simon. No one does more than this gifted artist to suggest that not only is contemporary art often outside the box, it is the box. Two sculptors, Hawley and Morgan, continue this alternative vibe with their non-traditional approach to a more conventional medium. With If We Fall in Love Tonight and You Are the One , Hawley lends both a personal and esoteric touch to ordinary natural and manmade objects. The former is particularly effective as a whimsical 3-D emulation of a sonnet containing the title line. Made of branches, a Rod Stewart tape, paper and nails, this is stuff that wishes and dreams are made of: fragile, precious and elusive. Conversely, Morgan’s Hearth Series made of stoneware brick and enjoying center stage is totemic and primitive. Both sturdy and graceful, this layered and lattice-like column would be at home on the plains or on an urban patio, either functional or ornamental. Morgan has created a “found object” that is timeless and universal. Two artists more preoccupied with time and place are Walkley and Souto, though their very different work is more conceptual than purely representational or figurative. Walkley has three acrylic paintings that impress with their palette and precision in a style that references George Ault, particularly his August Night at Russell’s Corner . In his own style that varies from the stark realism of The Rainy Day to the operatic expressionism of Clouds , Walkley uses dramatic angles, light and shadow to suggest that some special moments and places “choose” the artist or anyone with a curious eye and an open mind. Souto also offers a different perspective with his three minimalist graphite drawings, but his exquisitely etched mark-making is more abstract and selective in POV. In Through the River of Time 1,2 and 4 he composes standing figures waist down at the top of the frame and a wide gap of a patterned floor between them and the viewer at the bottom outside the margin. In this less-is-more but challenging scenario, only the viewer can complete the narrative or simply enjoy the view. Two well-established Nebraska artists, Zicafoose and Statom, show interesting variations on their signature work. She continues to draw upon 2-D inspiration for her abstract and painterly tapestry, particularly her triptych Blueprint # 7 in stark black and white, two thumb or finger prints that lend a larger-than-life heroic treatment to a simple universal code. In her colorful Prairie #3 she demonstrates that the earth has a blueprint also, manmade and natural as a vibrant blue sky hangs over a planted, wind driven and sun-baked, yellow and orange field of grain. Statom is well-known for his mythical and personal glass and iconic installations, but nothing quite prepares the viewer for his installation on the dock, Transparencia , made of mirror and wood or the mixed media marvel, Thirty Eight , consisting of mirror and video projection. The first is somewhat reminiscent of Statom’s previous gallery filling, multi-installation Nascita, but the latter is an ethereal moment of crystal blue and silver persuasion. Two additional works outside the gallery, one in Bemis’ main hallway, the other at Fred Simon, are also persuasive. Vercruysse is partial to her own totemic clay, steel and bronze pod-like forms, but Made in China , a variation on a Siberian Elm standing tall in the hall reminds one of her past creative Manipulation of Trees installation. In this work her elm sprouts fortune cookies, which invite the viewer to pluck and enjoy, leaving the fortune on the ground to sprout good luck to others. Meanwhile, Burmeister invites the viewer to join his crowd of Vermin.me multi-installed at Fred Simon. His signature set of mini-clay androgynous figures are here, there and everywhere in a set of small installations that in the aggregate mimic society’s self-gratification and love of mainstream pop culture. His social satire, however, is never strident. It varies here from vermin adulating the creation of one of their own on TV to a group attempting to “hustle” aboard an interactive record player in a suitcase. Exhibits like these prove how deserving NAC fellowship winners are of the money and encouragement it brings; but unless politicians, the public and the private sector continue to support 1% for Art in this state there may not be Another Nebraska three years from now. 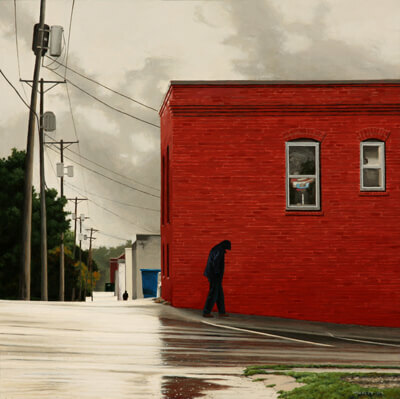 Another Nebraska is on display at the Bemis Center, 724 S. 12th St., through April 9, and at the Fred Simon Gallery, 1004 Farnam St., through Feb. 25. Visit bemiscenter.org or nebraskaartscouncil.org for more information .